March 2 is Dr. Seuss’ Birthday! To celebrate, I thought I would go on the hunt for Dr. Seuss Crochet Patterns. 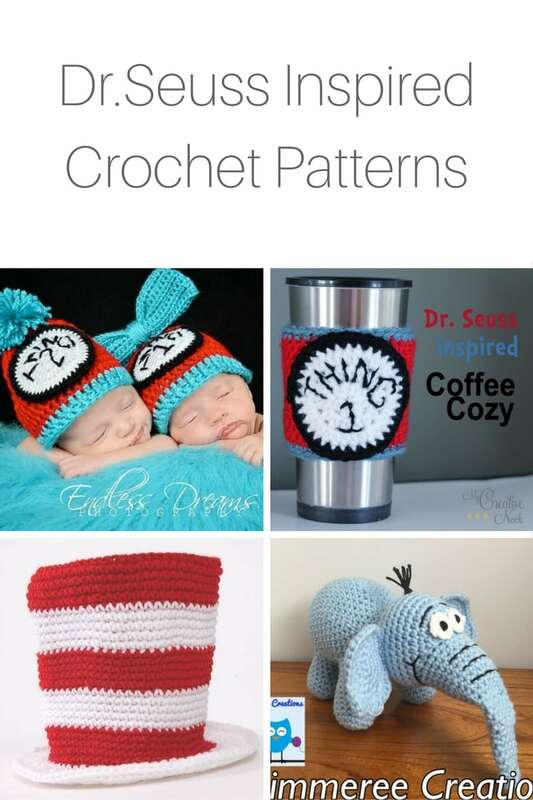 So grab up your favorite Seuss book, your hook, and yarn and make some fun crochet projects! This coffee cup cozy is inspired by Thing 1 and Thing 2 from the Cat In The Hat book. Know someone who is having twins? These hats would be adorable to make for a baby gift. Does your school have a Dr. Seuss Day? This would be so much fun to have! Kids or administrators could wear these to school to help celebrate! Hmmmmm….Wonder if I could get Miss Kitty to wear a cute little hat like this?? Remember the lovable Horton from Horton Hear A Who? This little guy, paired with the book, would be a perfect gift for a small child. These would be cute to play with! Know a little one who loves to play cook and the book Green Eggs and Ham? I have to say the How the Grinch Stole Christmas is my favorite Dr. Suess book. Here is a cute Grinch hat for the winter months! This looks just like the guy for The Lorax! Too cute! Pair it with the book and movie for a great gift idea.